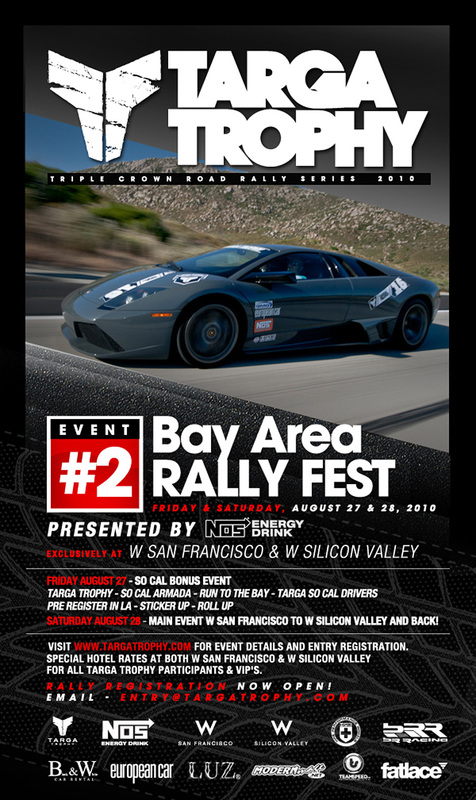 The Targa Trophy presented by NOS Energy Drink continues with their 2nd event of the Triple Crown Series this weekend, August 27-28 in the Bay Area. The rally will consist of sports cars, super cars, exotics, and more traveling from the W San Francisco towards the W Silicon Valley and back through backroads and scenic areas of the Bay Area. Fatlace will be campaigning 2 vehicles on this rally so be sure to check back after the weekend for the event coverage. Only a handful of spaces on the rally are still available if interested and more info can be found at www.targatrophy.com. For those that want to be part of the event experience without going on the rally itself. The Targa Trophy will be hosting SoCal vs NorCal presented by NOS Energy Drink and brought to you by SoCalEuro and Fatlace at the W Silicon Valley on Saturday August 28. Free admission and car entry. Register / More info HERE.